There is a colorful settlement Mykulychyn among the picturesque mountains of Ukrainian Carpathians at the altitude of 750 meters above the sea level, along the rapid mountain Prut River; its length is up to 44 kilometers. 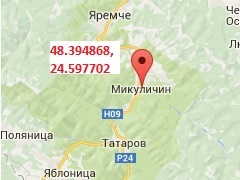 Due to it length, it is rightly considered the longest village of Ukraine. History of Mykulychyn dates back to the beginning of the XV century. However, according to historical data, the first mention of the settlement dates back to the X century. There is a thought that the prince of the Drevlian Mal established a military town called Iskorosty to protect the borders of the Kievan Rus. The current name of Mykulychyn, according to legend, comes from the brave boyar Mykula who defeated the enemy forces and saved local people from death. In gratitude the Prince of Galicia Danylo gave to brave Mykula saved lands and residents named their settlement after him. Today Mykulychyn belongs to Ivano-Frankivsk oblast. In five kilometers from it there is a famous resort Yaremche and in 10-25 km there are several the best resorts of Ukraine: Bukovel, Vorokhta and Yablunytsia. Mykulychyn is located in a very picturesque area in the Carpathian Natural National Park among everlasting green firs, beeches and rapid crystal springs and streams: Prut, Zhenets, Prutets Chemyhovskyi and the Carpathian Mountains. Mountains are situated around Mykulychyn; they are high, steep and silent: Makovytsia (985 m above the sea level), Velyka Rokyta Mountain (1100 m) and Yavornyk-Gorhan (1432 m). Mountains are seemed to keep and protect calm of the village. But for the mountains Mykulychyn is called «The Valley of the Winds». The thing is in the particular climate that arises from the meeting of cold and warm air masses. That is why to rest here is pleasant both in winter and in summer. As for winter rest in Mykulychyn, everything is clear: winter and Carpathians are phrases completely inseparable. Moreover, nature, climate and location here is very good for good rest in winter. You can sled, ski and snowboard here as well. 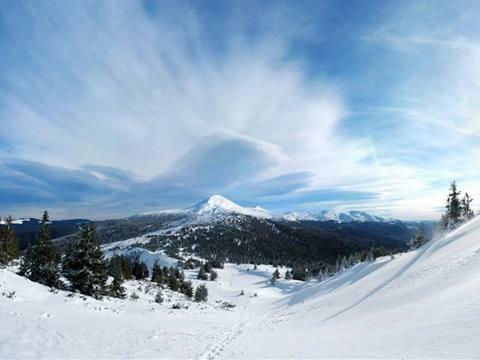 As it was mentioned above, near this settlement there are famous ski resorts: Bukovel, Yablunytsia and Vorokhta where you can choose tracks of different levels of complexity. Especially it is very nice to come here for holidays: New Year, Christmas, Epiphany and so on. Except traditional ski entertainment, it is added the atmosphere of special, colorful fairy tales. Diverting holidays and delicious dishes of traditional Ukrainian cuisine are that we should at least once to try and see in life. If you decide to visit this village in summer you will have pleasant and interesting holidays in Carpathians as well as in winter. There are lots to see here and to find an interesting entertainment in this beautiful season. The trade mark of Mykulychyn is Genetskyi waterfall Huk, which was formed in postwar years due to the great flood. This is one of the biggest and most amazing waterfalls of Carpathians. It is located at an altitude of almost nine hundred meters above the sea level and it flows along Zhenets River. Its height is 15 meters, and falling down it broken into small parts, creating a loud sound and amazing water show. Because of the noise that is heard from waterfall, local residents named it Huk waterfall. Another decoration of the village is wooden church of the Holy Trinity built in 1868 in traditional Hutsul style. The church is impressive for its size and beauty of the interior. The iconostasis and wall paintings are true masterpieces of art. In summer you will be offered to visit the National Park in Mykulychyn, to go to the forest for gathering mushrooms, berries and herbs, to go on excursions to the mountains, to swim in Mountains Rivers and lakes, fishing and so on. You also will be able to ride quad bikes, specialized bikes as well as to make horseback ridding around picturesque valleys and just enjoy the Carpathians’ nature, to breathe fragrant and incredibly healing local air. And the most important thing is that whether you choose summer or winter rest in Mykulychyn, you will always be able to choose the accommodation for themselves with suitable conditions, level of comfort and price. There are great number of hotels, houses, cottages and private houses in the village. Their owners and local residents are always ready to offer the best service, comfortable rest and welcoming atmosphere as well as to suggest delicious dishes of the national cuisine. Mykulychyn has a lot of restaurants, cafes and wooden restaurants as well. You can get to Mykulychyn by train Lviv- Rakhiv or commuter trains. There is one more route: you have to get to Ivano-Frankivsk and then to take regular buses to Mykulychyn.